Peter C. Craigie (August 18, 1938 - September 26, 1985) was a British biblical scholar, whose writings had an influence on me as a young seminary student. His untimely death was a great loss. 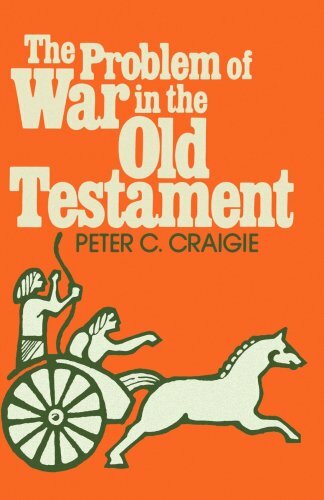 Craigie published a small book in 1978 (reprinted in 1983) entitled, The Problem of War in the Old Testament. It was the first book I encountered on the question of God and violence in the Old Testament texts. With some of the recent debate as to how to understand these narratives, particularly God's place in them, I think it would be good to review the arguments he made decades ago as they remain very valuable. I am going to publish a series of posts, which will mostly be quotes from Craigie's book (which will be presented in italics), but I will also insert some of my own comments as well in parentheses in standard block type. Third, there is the problem of ethics. Once again, the problem is complex. Are ethical teachings in Christianity to be based on the New Testament alone? (No, the Old Testament was Jesus' Bible as well as Paul's. It is, therefore, our Bible too.) Or may they be developed on the basis of the whole Bible? (Yes.) If all the Bible has relevance for ethics (the Ten Commandments, after all, are contained in the Old Testament), does it not follow that war may be pursued legitimately? (I think this is an important question, but a question that at this point may divert us from the problem at hand-- namely what do do with these particular Old Testament texts.) But if war may be pursued legitimately, would this position not appear to be somewhat in conflict with the New Testament? (I say, yes, but Christians have disagreed over this for 1,700 years. In the next post, we will take up Craigie's discussion of the first dilemma-- the problem of God. So what if we were to take just as seriously the apocalyptic metanarrative that lies behind the rhetoric of the kingdom of God in the NT? I would submit the NT does not at all present God as simply loving, but rather absolutely determined in love to deliver us and all creation. Such deliverance is often portrayed within the rhetoric of warfare.